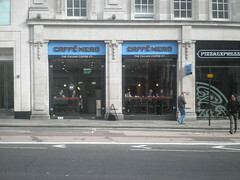 Branch of the Caffe Nero coffee chain. Some outside seating. It is quite big. Accessibility: No stairs to enter but has toilets downstairs. Last visited by secretlondon, August 2009. Opening hours taken from the Caffe Nero website, June 2013. Last edited 2013-10-09 14:26:55 (version 3; diff). List all versions. Page last edited 2013-10-09 14:26:55 (version 3).